"These are the only things they have to represent their culture: the poems and music, and Islam. And I believe these came into conflict when the Taliban chose one over the other. " 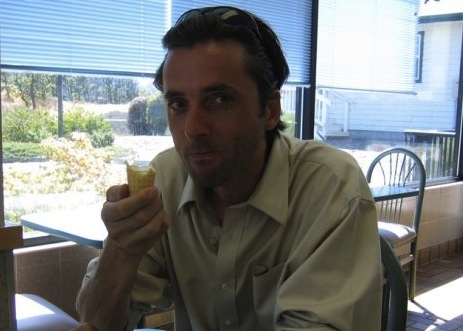 Beb C. Reynol is a French-born photojournalist who has been based in the United States since 1990. He has traveled extensively in Pakistan and Afghanistan documenting the lives of the Pashtun people, and other ethnic groups that share a region that overlaps the two nations, through tellingly forbidden photographic portraits. His exhibition, "Forced Destiny," has toured the West Coast of the United States and Canada. A new documentary project, "Forbidden Faces," is in progress. Artocratic interviewed him over tea, chocolate and Persian dates at his current home in Seattle. We were curious to know what exactly has compelled him to explore these places and people at such an acutely turbulent time. Greg Dember: Let's just start with some basic facts. How many trips have you made to Afghanistan and Pakistan? Beb C. Reynol: Two trips to Afghanistan and five to Pakistan. G: When was the first trip? B: I went to Pakistan in 1999 and lived there for six months. G: Why did you decide to do that? B: I was preparing at the time for two different possible destinations. So, for about half a year I was researching Peru, and at the same time I was studying Pakistan. Both are highly mountainous countries where you can possibly find very remote places. And when I say places, what I'm really interested in is the people in those places. My work as a photojournalist is based on meeting people and hearing their stories. I ended up picking Pakistan over Peru because of the coup by General Musharraf. This convinced me that my direction should be Pakistan. G: So the coup drew your interest, rather than frightening you away from Pakistan. Were there specific people you wanted to meet in Pakistan? B: Yes, I was interested in the Pashtuns, who at the time were very little known by most people. I was reading a lot about them and the region where they live, the Northwest Frontier Province. It is a tribal belt going from North to South on the extreme West side of Pakistan. Apparently, about once every ten years a foreigner gets kidnapped there, and all of this area attracted my attention, because I believe that the places that seem to be dangerous... those places are always hiding some really amazing stories. So that is why I went to the Pashtun areas. So I landed in Islamabad and right away within a week I took public transportation to Peshawar. Peshawar is the capitol of the Northwest Frontier Province. And it is definitely a very dramatic city, in every sense. It is very different from Islamabad, which is a much more modern, Westernized city, and when I returned from Peshawar, I was asked a lot questions by Pakistanis who lived in Islamabad. G: The residents of Islamabad wanted to learn from you about this remote region, even though you are a foreigner from much farther away. B: That's right. So Peshawar,because of its involvement in the war in Afghanistan, and with the Taliban, even before -- being a base for training camps -- basically Peshawar has always been connected to lots of espionage stories. The Taliban groups have always been raiding along this tribal belt. So this is quite a fascinating geographical area with the potential for a tremendous amount of amazing stories. Not necessarily stories related to the war, but related to the strong culture of the Pashtun society. G: How was it to communicate with the people so you could learn their stories? B: Well it was challenging. I spent six months just acquainting myself with the culture and language. Every morning I spent several hours learning Pashto. In 1999 when I was in Peshawar, from there I took a trip to Mingora Swat. Mingora is one of the places where the Pakistani government is struggling the most to try to flush out the Taliban. I even stayed with a pro-Taliban family who were very open about their opinions about the Taliban. At the time, there there were a lot of Pashtun who were supporting the Taliban. G: Were you sympathetic to their reasoning? B: No, I was sympathetic to what I was actually learning about the culture. I can't really say I was sympathetic or antipathetic to their politics, because at that time I had not had the chance to set foot in Afghanistan, to see the results of the Taliban influence there, so my focus was really on observing the ethnic group. G: What were some of the first things you learned about their culture that fascinated you? B: Well, it's important to realize that, especially in this region, there is no precise boundary when it comes to culture; it is always mixed with religion and politics. Trying to understand the relationship between the Pashtun culture and Talibanism is a big question for me. The idea of the project is to understand who the Pashtuns really are. And the more you learn about them, the more you learn about their passion for poetry and music. At the same time these people are quite often followers of the Taliban, who suppress poetry and music. So I always wonder, do they support the Taliban because they think it is a great idea, or because the Taliban are fellow Pashtun? We know that Talibanism was born in Pashtun villages on the border between Pakistan and Afghanistan. There has been a desire to reunite the Pashtun lands in this region ever since Britain created the Durand Line, in 1893, that separated Pakistan and Afghanistan. G: Is that sense of Pashtun identity separate from Islam? B: Absolutely. In this series of portraits, I am working on, I am actually only repeating what has happened before. I am following the example the Pashtun have set themselves. 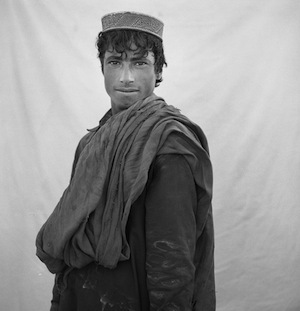 B: When the Taliban regime took control of Afghanistan from 1996 to 2001, basically their own soldiers were secretly having their photographs taken by local photographers, even though the studios had been banned. 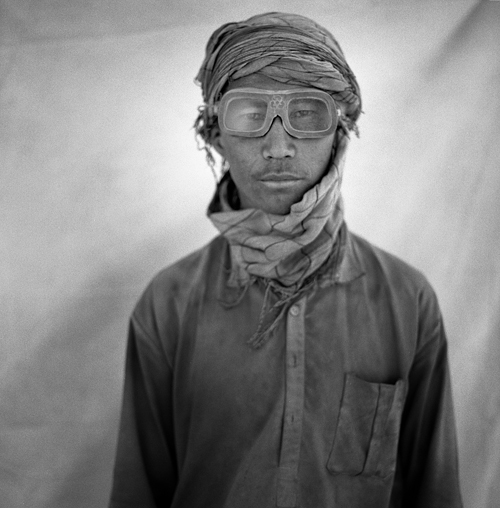 These men were expressing themselves by having their portraits taken with objects that were obviously prohibited by the Taliban, objects that were not in alignment with the Taliban's version of Islam. G: What are some examples of such objects? B: A boom box, a bird, a flower, or even a man holding hands with another man, which might be taken as a sign of homosexuality. These tokens are part of their identity. And I do believe that is part of the reason why some of the Taliban soldiers felt inclined to do those portraits, when I asked them to, and take the risk doing it, because they wanted to express themselves. Illiteracy in Afghanistan is huge -- I think between 80 to 90 percent of the population do not know how to read or write -- so you cannot really appreciate the culture through reading. There is no writing. Pashtun culture is an oral system. So they did, without knowing it, utilize photography as a very meaningful way to express themselves, about things that are important in their lives. So they sat for those portraits and you could say, at this point, that those pictures were worth a thousand words. B: The photography is a tool that they have used for expressing themselves, and it is a tool I am using and I will record audio and ask them some questions about their culture. Very often they end up talking about the same two things, which are poetry and music. Both were prohibited by the Taliban. The reason I am also doing this in Southern Afghanistan in Kandahar, is because this is where the Taliban still have a very strong influence. G: So, you want to see how the Pashtun have reacted, or are reacting, to the presence of the Taliban. B: Well, yes, but it's complicated, because if you look at a person, it is not easy to tell if they are Taliban or not. G: And Taliban literally means student, right? B: Yes, but you can be a student for the rest of your life… so you can be a Talib, a young student at the Madrassa, or you can be a Taliban follower, or you can be a Taliban solider, which probably means that you have been recruited and you are being paid to become the army of the Taliban.